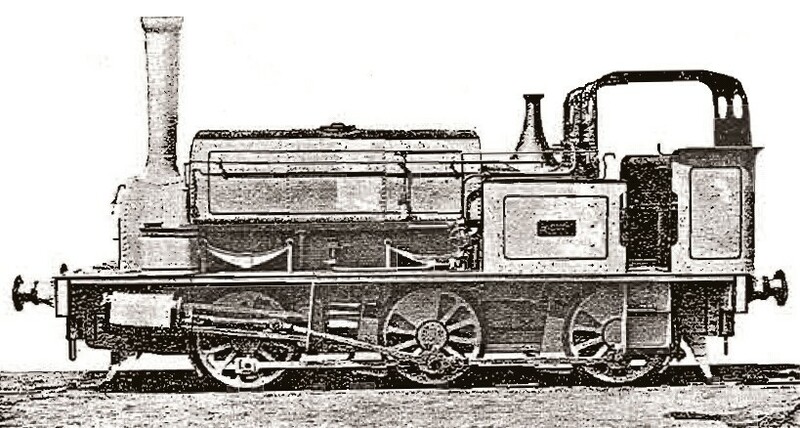 Above, an 0-6-0ST by E B Wilson & Co of Leeds, c.1865. The "Alliance" and "Victory" which ran on the Grand Crimean Central Railway 1855-1856 were probably similar. As any novel fact connected with the conduct of the War has a peculiar interest at the present time, and as a good deal is being said about the miserable state of the Balaklava Railway, it may be gratifying to many to learn that the Government are no means disposed to allow this peculiarly British creation to be "washed our" or a stick-in-the-mud. The Government had decided to send out another locomotive engine of a make suitable to the heavy gradients on the above line, and last Thursday week, Lord Panmure gave instructions for such an engine to be procured. Messrs. Peto & Brassey immediately despatched an agent, who, by Sautrday morning, was fortunute enough to meet with an purchase an engine in this town. It is one constructed a short while ago by Messrs E. B. Wilson & Co., of Railway Foundry, and has been working a few months. It is a tank engine, namely one which carries its own water in a tank placed on top of the boiler. All the wheels are coupled, so that although its weight with fuel and water will not exceed 12 tons it will be able to draw very considerable loads, say thirty tons, at an average speed up the inclines. Its lightness will make it admirable adapted for the soft foundation of the railway. The engine which leaves here for Southampton today has had a thorough renovation, and repaitning at the Railway Foundry. Her "Iron Sides" are adorned with the English, French Turkish and Sardinian flags conspicuously painted thereon, and she is called the "Alliance". She will be embarked for the Crimea by the middle of next week, so that her whistle may in two or three weeks be blended with the other notes of defiance hurled against the common foe, and her shrill voice shall not be the least emphatic declaration of the Allies to carry on this war with the utmost vigour." "A Locomotive for Balaklava: A Locomotive engine called "The Alliance" left the Railway Foundry, Leeds, on Friday last. The engine is what is called a tank engine. It has two 11-inch cylinders, 17 inches stroke, six wheels, three feet diameter, all coupled. It was purchased a few days ago by a government agent. The words "The Alliance," and the national flags of England, France, Turkey, and Sardinia were painted on the sides of the engine." On Saturday Morning a graphic message was received at the Railway Foundry, Leeds, ordering a second Locomotive tank engine for the Crimean Railway, similar to the one sent out a few days previously. The engine had been the property of Sir John Lister Kaye and at the time the order was recieved was working at Sir John's colliery and was brought down to the Railway Foundry, and after being overhauled will be despatched to its destination." The Leeds Intelligencier states that "The Alliance" was shipped from the Railway Foundry via Southampton to the Crimea in its edition of 8 September 1855. She was "a small locomotive"..."what is a called a tank locomotive so that it carries all the water and fuel it requires on the body of the engine". It is clear "Alliance" was the second engine in use on the Crimean Railway and was sent out because the first locomotive was not capable of hauling loads on the steeply-graded line. "Alliance" was a six-coupled saddle tank engine with driving wheels 3 feet in diameter. She was the first locomotive to be sent to the Crimea from Leeds and was apparently second hand. The second locomotive sent out "Victory" was purchased from Sir John Lister Kaye, having formerly worked his colliery railway. That too was presumably an 0-6-0 tank engine. Both locomotives were elaborately painted with national flags, a paint scheme which was worn in the Crimea. On Thursday Monring, a beautiful little engine , decorated with the flags of England, France, Turkey and Sardinia passed through Pontefract Station en-route for the Crimea." "three engines are now plying on it [the railway] taking along their waggons, both loaded and empty, their names are "Alliance", "Victory" and "Swan". The first two have four flags painted on each side, the two most prominent being the English Union Jack and the French Tricolour." W. H. Russell writing in The Times confirms the presence of "Alliance" and "Victory" and a third locomotive called "Swan". The locomotive in Argentina, "La Portuna" cannot have been either "Alliance" or "Victory" due to the wheel-arrangement (2-4-0), wheel size and gauge, and presumably never ran in the Crimea as the Grand Crimean Central Railway was laid to standard guage. It is a myth that the two engines from the Crimean Railway went to Buenos Aires! Please ignore previous blog post!